What Counts as Crawl for Search Console? Could Rotating GIFs Improve Performance? The results of my recent post ( breaking the head quietly) bothered me, since they didn’t sit right with my picture of how things work. Rendering is supposed to behave a little like a browser. And Indexing is supposed to currently be based on the rendering engine of Chrome 41. But search engines have to make decisions browser vendors do not, and these lead to unforeseen quirks and distinctions. Some of the things a browser will ignore, a search engine will need. And knowing where these quirks might cause problems is probably part of your job. The head has a title, meta description, two hreflang directives and an <img> wrapped in noscript tags. These have unique identifiers. The head then has a title, meta description , and two hreflang tags. These also have unique identifiers. This has held for over a month and I’ve not seen any substitutions happen. Is this the outcome you predicted? You may be thinking “So what? They just picked the first title tag and meta”. Incidentally this causes the head breaking issue. Only one tag can be used. 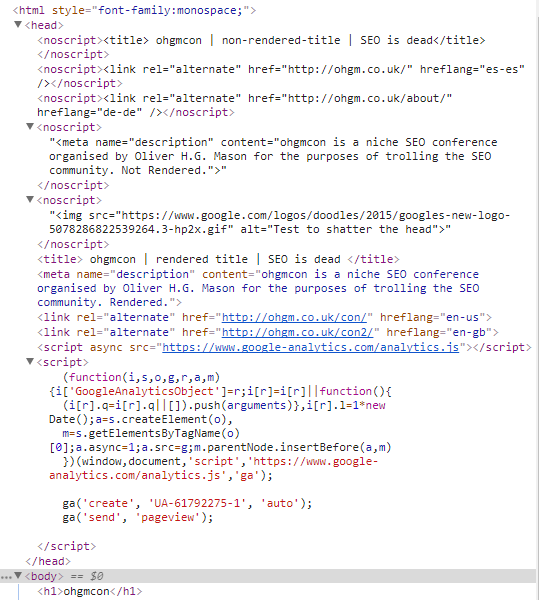 Google sees both tags but simply takes the first in the HTML. It’s brutal raw extraction. The head terminates early (Google is not escaping the IMG either), so Google only sees one title and meta. Hence these are the ones which are used. Title and Meta Description get special/not-special treatment because they can’t really be used to cause significant harm. 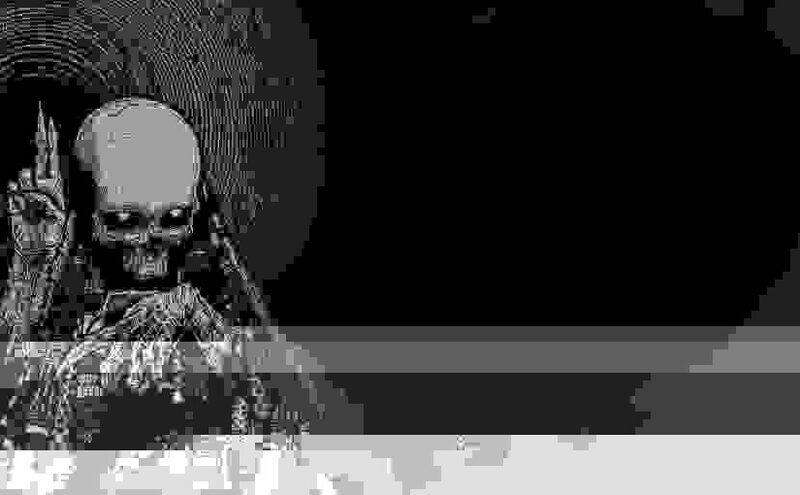 JS is enabled so the IMG does get escaped and the head is not broken, but the noscript-wrapped-tags that belong in the head (<title>, <meta>) do not get escaped and are evaluated as normal. Google indexes no hreflang tags. Google indexes all four hreflang tags. Google indexes only the <noscript> hreflang tags. Google indexes only the clean hreflang tags after the <img>. Other outcomes are of course possible, but one of the above seems most likely. Given what you now know about which title is appearing in the SERPS, what do you predict will happen and why? A brief aside – I was impatient for this report to be updated. The page had been indexed with the new content on the day I made the test, but nothing appeared in the hreflang report for several days. I did some digging across profiles and saw this pecularity I’d never thought about before. This is weird, but go and look. I did not know this before, and I hope you didn’t either otherwise I’ve just wasted 20 seconds of your time. Sitebulb user Tom Blackshire guesses that this is because the results update twice a week, and 3.5 days does not gel with daily refreshes, so 1 week = 3+4 days. The report defaults to 28 days so this kind of makes sense. We had results in the 1st 3-4 day refresh after the changes were made to the page. 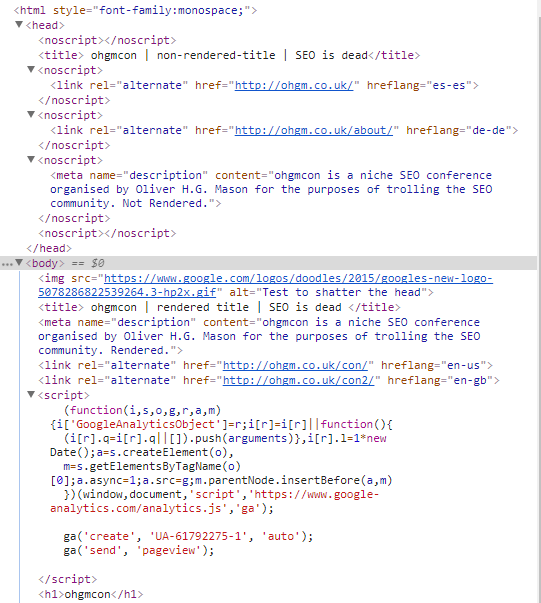 Google is just extracting from the raw downloaded html (very unlikely) – “is the hreflang in the head? yes? ok extract it”. Noscript doesn’t enter the equation, nor the head breaking, it’s a simple text parse. The head is broken, some hreflang is in the body, Google don’t care (very unlikely). I think the second option is most likely – Google is using the rendered DOM, but ignoring noscript exemptions for tags which belong in the head (at least those which Google care about). As Google is so careful with Hreflang not appearing in the body, picking up all 4 tags indicates that the head is not broken by the IMG, so the noscript around the IMG must be honoured. Maybe. If I added a GTM hreflang injection to this test, I don’t doubt that these injected directives would be picked up, too. If these overwrote the hreflang already in the HTML, I’d favour these being the ones picked up. 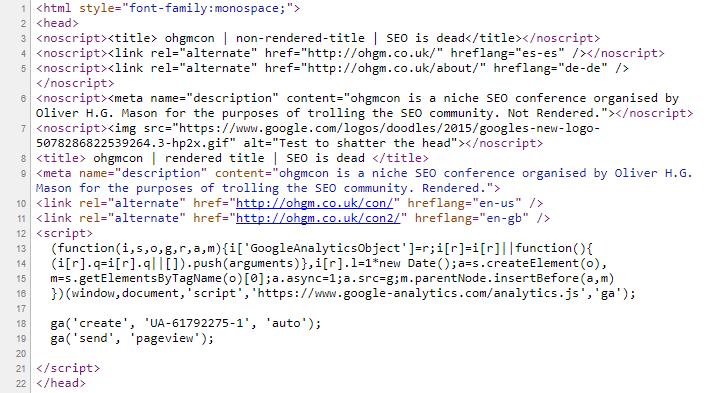 The hreflang report initially just picks up hreflang tags- it does not assess whether they are working or not. Because of the wording of the report (“no errors”), most people take the directive to be working when entries first appear. Update 2: Google are you ok? In over a month only the <noscript> Hreflang have been assessed. And over that period they dropped the assessment before reassessing. Even though the cache in that locale was updated with the new content, the content indexed was not. The cache can be ahead of what’s being ranked. I don’t think this is how most SEO professionals view what’s in the cache. Sure, they think that you can’t trust it for other (very good) reasons, but I don’t think we ever think of it as something that can be ‘early’. And I think this can lead to misdiagnosis of issues on the edge. Something to keep in mind with running your own experiments. Bing does not handle indexing this page in the same way as Google. There are simultaneously multiple meta-descriptions on the page, but no meta-descriptions in the head (but by the code snippet presented, there are). Is the head broken for Bing’s parser here? To me, as with Google, this indicates separate systems in place for extracting different directives and elements. Unfortunately Baidu did not consider the test URL up to par from natural crawl. Many thanks to Baidu account holder Owain Lloyd-Williams for submission. If it indexes I’ll update the post accordingly. PREDICTIONS PLEASE. Like the Search Engines, SEO tools do not report on this issue in the same way. If you’d like me to add your tool to this list, or lie about how your tool performs, or update these results, please set me up with an Eternal & Inheritable license. 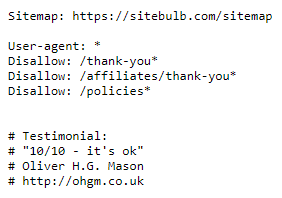 Rendered Title and Meta Description are used. 2 outgoing hreflang noticed. No information on which. Non-rendered Title & Meta Description used. 4 outgoing hreflang noticed. No information on which. Rendered title & Meta Description. Noscript contents ignored. 2 Rendered hreflang seen. Noscript contents ignored. Non-rendered title and Meta Description. Noscript contents used. Rendered title not seen. Rendered Meta-Description seen. All 4 hreflang seen. Correct destinations and codes. 2 Rendered Hreflang tags seen. Both Titles, Rendered title displayed as default. Both Meta Descriptions, Rendered Meta Description displayed as default. Identified all 4 Hreflang tags. I hope this goes some way to illustrate how beloved tools can all fall over in slightly different ways. Clearly some of these tools have some work to do, though I’m honestly not sure how they should change things. Should they try to emulate Google’s behaviour? Datacentres still matter. The content appearing in the cache is independent of the content being ranked for the query. The cache can be ahead of the index for a locale, and the cache content may be shared across multiples regions when the index is not. The hreflang error report operates on a 3-4-3-4 day update cycle. The hreflang error report does a two stage assessment. That there are no errors in the report does not mean there are no errors in reality, even when no changes have been made. Be less trusting of your tools in edge cases. More tests are needed, clearly. Clearly you shouldn’t extrapolate how Google works from such an artificial test, but if you did not accurately predict what would be indexed in these cases, what can you change so that you do? And should Google index the test like Yandex or DuckDuckGo? Love the Sitebulb plugs. Keep shilling hard for those big bucks! Next Next post: What Counts as Crawl for Search Console?